The Articulate Gallery is a multi award winning range of slot sided picture frames especially for the display of 2D and 3D children's artwork. It takes the children's pictures off the fridge door and places them in their rightful place in a frame on the wall in an instant. The children gain a sense of achievement when they see their artwork properly showcased, that helps build confidence. Confident and creative learning are vital parts of a child's development. These frames make a great gift for any family member. Unlike most other children's products, the kids don't grow out of them very quickly. 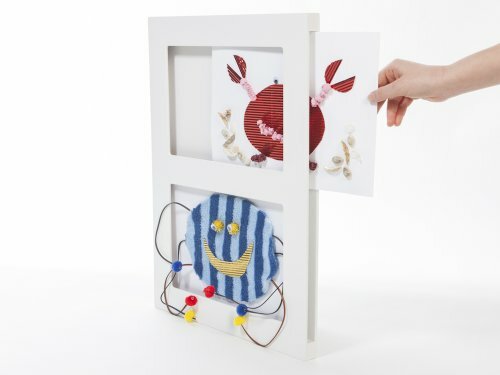 The frames allow easy rotation of the art and, being less expensive than conventional framing is a great way to encourage creativity in the children. The frames come in 9x12" Single, Double, Triple format. The frames were designed and developed by a husband and wife team who saw that children's art should be celebrated and displayed like a proper artist's. As Pablo Picasso said, 'every child is an artist' so every family should have an Articulate Gallery. If you have any questions about this product by The Articulate Gallery, contact us by completing and submitting the form below. If you are looking for a specif part number, please include it with your message.